In this blog post, I am excited to collaborate with Frances Perez, who will be writing a few upcoming posts. She will be sharing about experiences as a counselor in training, as well as her specialty interests. She is currently spending time with my practice to learn more about the counseling field. Welcome Frances! Frances is a 26-year-old homemaker and mother of 14-month-old Elias. The youngest of seven, Frances was the first to graduate college with a BS in Criminal Justice from Medaille College. A Buffalo native, she has lived in the Rochester area for two years. Currently she is working part-time at the Tennis Club of Rochester as a front desk manager, while completing her Master's degree in Clinical Mental Health Counseling at Medaille College. In the past, Frances interned at Evergreen Health Services and has training in Narcon administration through the agency. She enjoys reading, video games and walking her two dogs and son in the nearby parks. Frances is also learning ASL in hopes of working with the deaf and hearing impaired population in the future. Frances hopes to travel around the world to provide and teach counseling to many different people and cultures. A conversation Frances and I were having spurred this post. We hope it gets you thinking about your own background and how it influences the way you see the world. 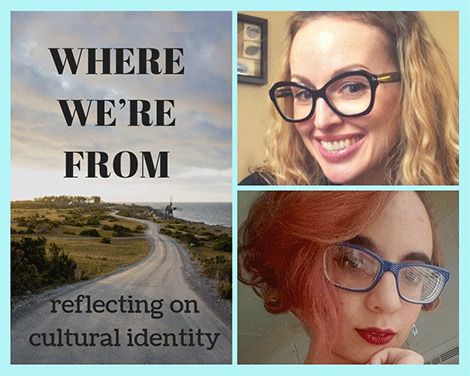 Does where you are from, your cultural background, or your family affect the way you see yourself and the world? As counselors, our own backgrounds do influence our ways of relating to others. We use aspects of ourselves to support our work with clients. So, what is culturally competent counseling? Being a culturally competent counselor can encompass several qualities, behaviors and activities. One central factor is a counselor’s self-awareness of their world-view. The American Counseling Association Multicultural Competencies (2015) states “counselors develop self-awareness, so that they may explore their attitudes and beliefs, develop knowledge, skills, and action relative to their self-awareness and worldview". “When I consider how my culture my affects my counseling work I became aware that I wasn’t raised strongly in any cultural traditions. However, I was fortunate enough to be immersed in multiple cultures growing up. Growing up in the inner city, my peers and classmates were from all over the world. The neighbors to the right of me were Hispanic, the neighbors directly across the street were Vietnamese, my best friend in elementary school was Muslim, the neighbor to the left was Caucasian and my classmates were African-Americans. If they did something differently than I did in my house, I would simply ask why? Asking questions allowed me to learn about their culture. I used to believe I didn’t ‘have a culture’ because my heritage is European and I am White. As I looked closer and examined my own beliefs, attitudes and values, I realize I am influenced by western ideology, protestant ethics, and American culture. I grew up in Wyoming in a rural community. People in my community lived far from one another and from town. Being close to wilderness meant people thought of themselves as tough against harsh elements. Working hard on farms and ranches meant many people viewed themselves as independent. This shaped my worldview, and when I noticed other cultures are more interdependent and connected, this was new to me. I didn’t realize most people in the world have a history, tradition and rootedness of in religious and cultural groups. Traveling to India for the first time I was amazed to learn of all the institutions and groups that existed "BC". In comparison, the town I grew up was only 100 years old! Do our stories get you thinking about your own history or family? Here are 3 ways to consider your own worldview. 1) Do a little digging. Many of us take our own world view for granted. We don't see it but it is all around us. Are there traditions in your family or ways of doing things that are interesting to you? Your could find out who originated a favorite family recipe and what influenced them. Is there a saying or mannerism that you notice people in your family share? What do people do at holidays and why? Finding the origins of subtle family traditions may be clues to your family's culture. 2) Recognize aspects of your own identity, the privileged as well as ways you may have been marginalized. The work of Dr. Kenneth Hardy, a therapist and professor in family systems has talked about the 'tasks' of people in privileged positions and for those who are oppressed. He suggests recognizing the difference between one's intentions and the consequences of one's actions. I may say something hurtful without intending to, but if another person is hurt by my words, I can listen, believe and care about that hurt. Another task he mentions is voicing our experiences, claiming our stories vs. remaining silent about hurts. 3) Listen and observe experiences different than your own. Getting out of your comfort zone and reflecting about your experience can expand your view. Noticing other cultures and traditions without judgment can help us appreciate our own history as well as the richness of our world.